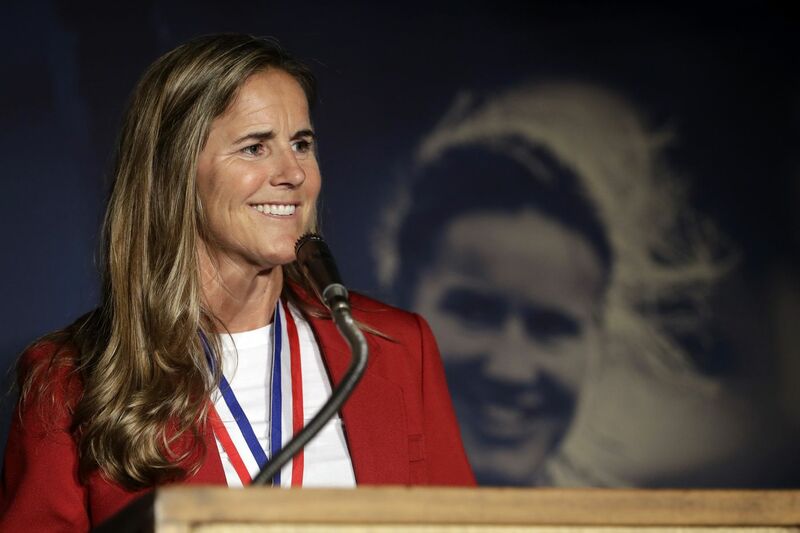 1999 Women's World Cup champion Brandi Chastain was inducted into the National Soccer Hall of Fame in 2016. Twenty years after the most famous penalty kick in women’s soccer history, Brandi Chastain is back in the spotlight. She and some other of the biggest stars of the 1999 World Cup-winning U.S. national team — Michelle Akers, Kristine Lilly, Briana Scurry, Kate Markgraf, and Shannon MacMillan — gathered last week to reminisce about their historic triumph at a forum in New York hosted by the International Champions Cup. Chastain has spent plenty of time in the public eye since hanging up her cleats, including as a broadcaster for ESPN and NBC. But believe it or not, she hasn't spent all that much time with her former teammates. Certainly not at an event like this. "It's hard to put into words … to explain how wonderful it is to be on a panel, to sit next to these women, to share our stories," she said. "I'm humbled and I'm grateful for the time that I've had with these women. … We don't get to spend quality time — even though we're in front of all of you, it's still quality time for us." The event space buzzed with energy from the players, fans and media who jammed in. Chastain felt it, and felt the strength of a bond that has lasted for a generation. "There's something really special that happens in teams — and successful teams, specifically — when you can look across a field of 120 yards by 75 wide with 90,000 screaming fans, and look each other in the eye and know exactly how they're feeling. We were that connected," Chastain said. "We are being represented in a way that we never have before. It really, for us, it tells us that what we were doing was important, and that right now, at this time, women's soccer is at an all-time high." From left to right: panel moderator (and 2015 World Cup champion) Heather O'Reilly, Kate Markgraf, Brandi Chastain, Michelle Akers, Kristine Lilly, Brianna Scurry and Shannon MacMillan. She was asked whether the time has gone by quickly. "It's incredible to think 20 years have passed," she said. "I'm a parent now, and I think the fact that I have a young son who wasn't around when I kicked that penalty kick — to share the stories with him is wonderful. The time flies. And you have to embrace it. I'm still dreaming of soccer." Then Chastain said something that made everyone stop just as dead in their tracks as they did when she struck that ball 20 years ago and celebrated like decades of anonymous men did before her. "I want to be a coach on the national team," she said. "I want to influence the next generation. The experiences I've had are too valuable. I need to be a part of what's happening with our next youth national teams, and I'll continue to fight for that every day I can." There was a fire in her words. Everyone present felt it. She invoked the spirit of the 1999 team's legendary coach, the late Tony DiCicco, whose "I love my job!" rallying cry still echoes across the sport. "I want to bring Tony's life back to the sideline," she said. "I want to give back what he gave me." Those words surely will resonate across American soccer. And Chastain will surely have plenty of people rooting for her to not just be hired, but listened to. For the moment, though, Chastain is doing the rooting. It’s a World Cup year again, and, as everyone knows, the U.S. is the reigning champion for the first sime since Chastain’s era. Of course, she had a few things to say about the current players and whether they will defend the title this summer in France. "We have taken the level of athleticism that we've always had, and we're using it for good in terms of how do we exploit other teams with our technical ability now, and not just our athleticism and our will to win," Chastain said. "Megan Rapinoe, to me right now, is the player to watch. I think she's got a grace and a love and a childlike joy for the game, and she loves the small, subtle things that happen in every moment. But I don't think that's unique anymore. I think there's a lot of tremendous players that are gracing the fields." And, yes, Chastain does think the U.S. will win it all again this year. She also thinks the current players can win off the field, specifically in the courtroom, where they’re suing the U.S. Soccer Federation over years of unequal treatment. “I think initially my reaction was, I’m exhausted of talking about this. It’s 2019, why are we talking about [it] — there should be equality,” she said. "It’s such a foregone conclusion that yes, men and women doing the same job should be paid the same amount. Full stop, bottom line. Then I go to, I’m grateful that they are courageous enough, even in this time, when they have so much on the line, that they are willing to continue the conversation. … It’s critical for these women to still fight, because they are the role models for the next generation who are going to come along and say, ‘I’m not putting up with that anymore. I’m done. It’s over. Move on.’ "
Chastain remains in the fight, as she has for over 20 years. She has no intention of going away. A poster published in the July 12, 1999 Daily News commemorating the U.S. women's soccer team's World Cup triumph.